The Love Theme from Alfred Hitchcock's VERTIGO was turned into a song, "Madeleine:" with lyrics by Larry Orenstein. 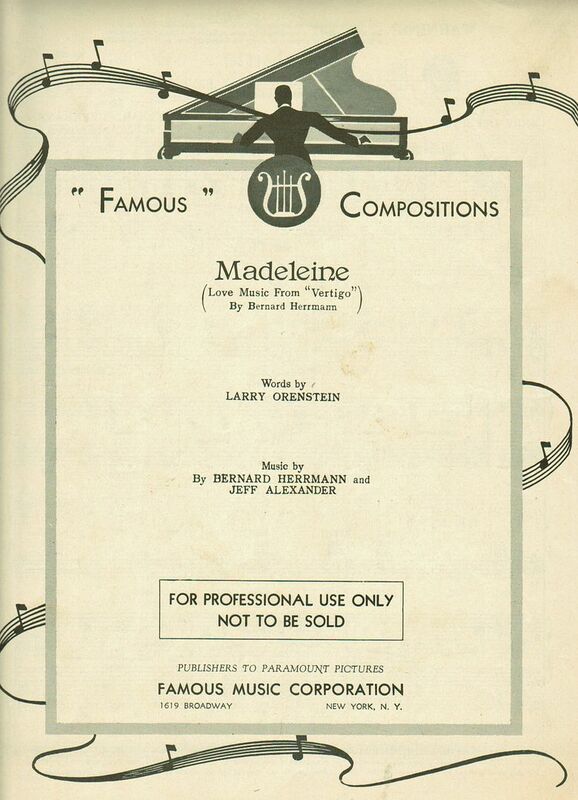 Strangely, composer Jeff Alexander is listed as a co-composer of the tune. Here singer Stephen Van Dorn sight-reads a first run-through of the tune with pianist Mike Farrell. This series is so frigging inspiring you wonder why someone else hasn't unearthed these gems for albums and shows. The film composer prejudice must be alive and well. Very haunting piece. It sure is nice to be able to discover another dimension of exploration of our love of film music. Perhaps it will inspire others to bring it to life in new and fresh ways. Wow, I've only waited 50 or so years to hear this... Amazing! Half a century is a mighty long wait! Glad you could finally hear it! What a turkey. No wonder it was forgotten. I'm so glad I've now had the chance to hear this [though is it the complete song? ], thanks for posting, though it isn't very good is it [did the lyric writer actually see the film?]? I remember not minding the Marnie song that was written [can't remember where I heard it now, but I did hear it once] too much though. It is/was a fairly common practice to not directly reference the details of the film in approaching the lyrics to an instrumental film theme. Granted, that practice did not help in this case. I'm sure Bernard Herrmann would NOT like this, but I think it's a great performance - regardless of the lyrics. There actually was a 'Vertigo' song by Billy Eckstine - with no reference to Bernard Herrmann. Wagner should be listed as composer too, everyone knows Herrmann recycled Tristan und Isolde's "Liebestod" for Vertigo. Like in the opera, it should be sung by the female character in Vertigo, not the male. I've always felt the music was Judy apologizing and begging Scotty to forgive her and give her another chance, even after "death". This piano bar version is rather minor league, it doesn't capture the intensity of Herrmann, let alone Wagner. The guy has an ordinary voice and doesn't sing the words with passion. Nice little effort though. That was more than a bit of a struggle, although I blame the melody and NOT the singer!